I've always loved printed dresses for work. A dress is an easy instant outfit, quick to pull together and a print adds a little extra interest. Don't let the winter weather put you off either! Add fleece lined tights to your dress, a cosy trench coat, scarf and maybe even a cardigan too. Below I'm wearing an old favourite dress in a new way, and a new-to-me dress I got from my Grandma's wardrobe. 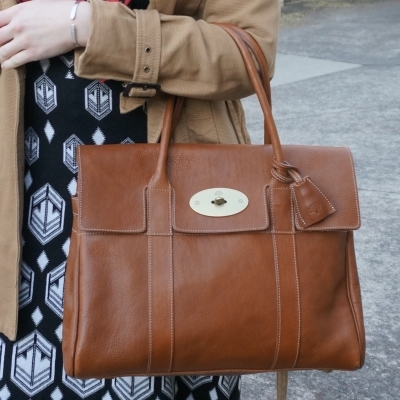 It was good to get my Mulberry Bayswater out again too, it's been packed away for over a year and a half while on maternity leave as I use it as an office-only bag. This Leona Edmiston dress is an old favourite, perfect for the office. I liked how the loose lower half worked nicely in pregnancy too, from hiding an early baby bump to fitting a second trimester belly. After not being able to squeeze into the outfit I'd planned to wear the week before, I was grateful to have this in my wardrobe as I knew it would definitely fit! When I've worn this dress in the past I've usually picked pink accessories to wear with it, tying in with the pink in the fern print. I thought I'd try it with blue instead for a bit of a change, I liked it. Since I was trying a new colour combination, I kept the shoes and bag neutral. 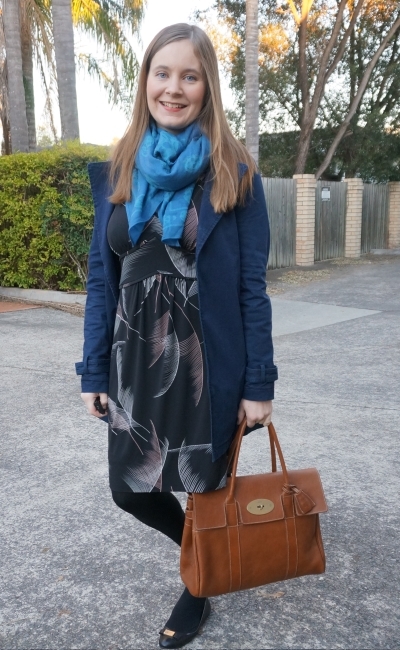 Last worn: navy mac jacket, wool skull scarf, fern print dress, Marc Jacobs flats, Mulberry Bayswater tote. Other ways to wear: navy mac jacket and printed jeans, wool skull scarf and teal top, fern print dress and pink accessories, Marc Jacobs flats and colourful jeans, Mulberry Bayswater tote for casual Friday. Perfect for pregnancy: printed dress in second trimester, Mulberry Bayswater and third trimester bump. My mum bought this dress back from a visit with my grandparents at the start of the year. It's labeled to be 3 sizes larger than I usually wear, but we are all fairly certain the label is wrong. It's a lovely knit dress, so perfect for winter. I wanted to add a little colour to the outfit and was hunting through for a scarf when I saw this neon leopard print one hasn't been worn yet this year I thought it was ideal. I figured it was far enough from the fun blurred black and white print on the skirt to work. Still not completely sure on it looking at the photos now, but I did feel happy and comfortable in this during the day. I'd love to wear this dress with heels too - being petite, midi lengths like this can sometimes make me look shorter than I am. I considered getting this hemmed but not sure I want to loose the slight scalloped edge that's there at the moment, so I'll just try it with heels next time. Last worn: camel trench, neon leopard print scarf, gold mouse flats, Mulberry Bayswater (above). First time I've worn the dress as it's a hand-me-down from my Grandma's wardrobe. Other ways to wear: camel trench and jeans, neon leopard print scarf and grey tee, gold mouse flats and skinny jeans, Mulberry Bayswater and orange dress. Perfect for pregnancy: trench coat in the first trimester, scarf hiding a first trimester belly, mouse flats and maternity pencil skirt, Mulberry Bayswater and wrap dress in second trimester. A classic little black dress works for so many occasions. Just like a plain dress, a printed dress is perfect for the office. A dress is an instant pull-on and go outfit that you don't need to think too hard about accessorising with. You can definitely have fun and try different accessories with it though, especially in winter when you pull most of the layers off when you get to your workplace anyway. Linking up with On Trend, Trend Spin, Turning Heads, Confident Twosday, Style On The Daily, Fashion Frenzy, Modest Monday. Both of these dresses look lovely on you. Interesting that that second dress had the wrong size label- it happens sometimes. That is why I think it is best to try everything on before we buy it. We never know if the size label is completely correct. Not to mention that there are different sizes for different countries so that can be confusing as well. Printed dresses are perfect for the office. Definitely help make drab spaces exciting hehehehe. I love the first dress and the second one paired with that fabulous scarf! I love the second dress, the pattern is great. I personally am a fan of midi length, but I am quite tall, so it works on me. I wish I had the height to pull it off effortlessly! Both dresses look good, I steer towards the second dress, i love the pattern mix with the scarf. You're looking good Mica ! I love your grandmothers dress, the print is so unique and the trench you've layered over it is so gorgeous as well. Great post, thanks for sharing :) these looks are so stylish! I always say I'm not one for dresses but when I look at my closet, I see lots of printed dresses or rompers, haha. 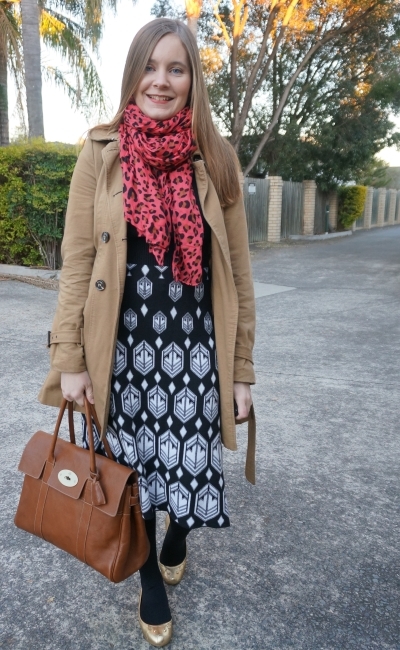 Love how you paired the second one with another printed scarf too; I'm wary of mixing prints as I don't know how but it looks good on you! Dresses are such a great one and done option especially for work. The prints on both of these are so fun and chic at the same time! Ahh I missed your old Mulberry bag! They are seriously my favorite!! haha it has been packed away for so long! The second dress is FAB on you, Mica! I love the bright pop of coral-pink, the metallic shoe (YES) and I think the hem is just right. I'm vertically-challenged too (5'4") but you're proportioned evenly, so you don't look short. Don't change the hem! Flawless looks! I love the scarves! I LOVE your bag. It's so cute!!! It goes great with both your outfits! I love your outfit! Mulberry is an amazing brand! I'm on the lookout for some new print dresses as they are so easy for work as you've said. I'm getting fussier about sleeves and waists and necklines though so I haven't popped on anything just yet though I did see 40% off Atmos&Here at The Iconic . . .
Those 40% off sales are always so tempting! Love these looks! 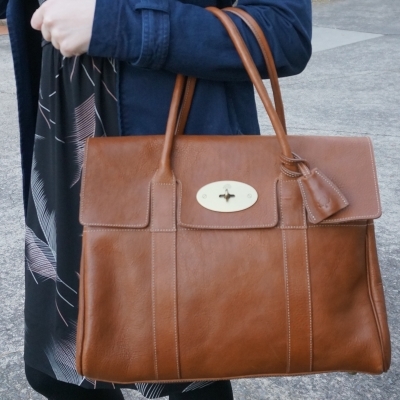 I've always wanted a Mulberry bag because the quality looks great and seems so versatile! haha yes my collection is definitely out of control! I love that black and white knit dress! I wish my grandma has some old garderobe I could choose some outfits from when she was young! I am moving so many time too bad I can't keep all my clothes for my grandchild! I honestly think a dress with fleece tights and boots can be warmer than pants on a chilly day! And your new-to-you dress is so pretty! The black and white pattern will make it fun to add colorful accessories to the more you wear it! It's those fleecy tights, so cosy! Such a great classic bag! That Mulberry Bayswater Bag is absolutely a stunner Mica. It's the type of bag that will look good with everything. Love both dresses and coats you paired together. I really love the second look especially your handbag! You have the best collection of bags! Dressing up in winter is always a dilemma for me - we need thicker layers here and I don't quite know how to jazz it up without looking like a snowman lol. Your style is very chic though! Love the scarves. That Mulberry is such a great timeless piece and indeed perfect for the office! I love printed dresses for the reason you've mentioned, they really are a one and done piece, especially for moms on the go! Thanks for sharing, girl, and I hope you have a great rest of the week! I love the first dress, and the handbag! Super cute, and you wear them well! I love idea of layering a dress for winter. I absolutely love the blue trench! I love the print of both of those dresses--they're really different and pretty. I'm getting excited to be able to wear my dresses again here in a few months. I love seeing all your work looks Mica; I'm getting so much inspiration for colder weather! You look great! I love the blue jacket and your bag. Fab!